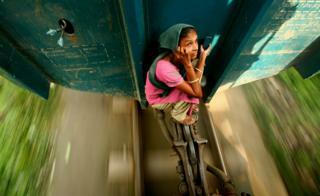 A young woman perches on the carriage-locking system of a speeding train in Bangladesh to avoid paying the fare. 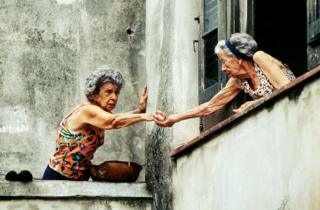 The image was taken by GMB Akash, the winner of Travel Photographer of the Year in 2009. It features in a new free exhibition at Greenwich in London, showcasing the latest winning images from the awards - plus some of the judges' favourites from the competition's past 14 years. Scroll down to see some of the photographs on display. 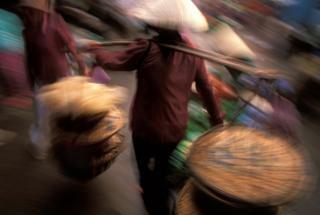 Judge's comment: "Hoi An's morning market is bustling with colour and movement, all brilliantly captured by Michael Matlach's camera, encapsulating the essence of the market in one image." 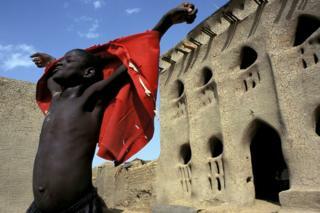 A young boy celebrates the arrival of a cool breeze during the hot season. Photographer Lorne Resnick: "I had just entered the courtyard of the apartment complex, and for some reason I glanced behind me. There I saw the beginnings of this window-side commerce, as one woman handed a pair of eggs to another." 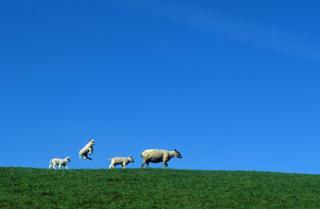 Judge's comment: "A fortuitous moment as he focused on this little family of sheep resulted in Gerard Kingma capturing the perfect winning image on the theme 'Moment of Freedom'!" 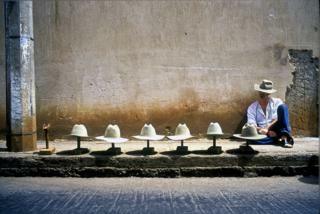 A hat seller displays his wares by the roadside in the Mexican town of Tepatitlan. The simple image raises questions. Is the seller sleeping? Is he wearing the hat that was on the empty stand on the left? Or has he sold one? 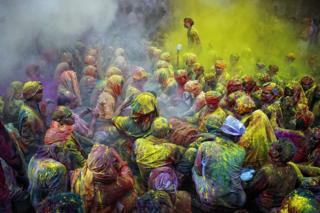 The Hindu festival of Holi is a vibrant, energetic celebration which marks the end of winter and the arrival of spring. Photographer Thomas Kokta: "With solar storms at their peak, I knew 2011 was going to be a great year for the Aurora Borealis, so I set aside three weeks in the high Canadian Arctic to try to capture this stunning phenomenon. 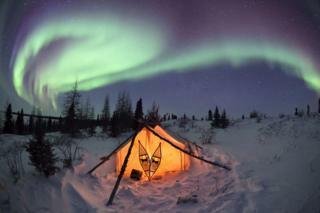 I spent these nights outside in temperatures of around -40C to -45C." 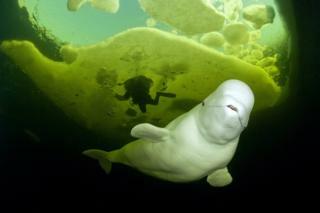 Photographer Franco Banfi: "The beluga whale swam to me and turned away just before touching me. He did it several times before starting to come close and stopping in front of me, giving me the chance to take some pictures. He wasn't aggressive, he just wanted to play." 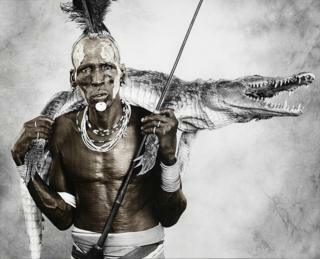 Photographer Jan Schlegel: "Biwa is one of the very respected warriors of the Karo tribe. Full of pride, he told me he had killed three lions, four elephants, five leopards, 15 buffalos, many crocodiles and several people in a war with the neighbouring tribes. After a deep breath, he said that times have changed and hunting is not allowed any more. And that he misses the old traditions of his ancestors." The Nenets are nomadic pastoralist people who live beyond the Arctic Circle in a difficult environment and harsh weather. They live in a "chum", a temporary dwelling made with reindeer skin and fur. 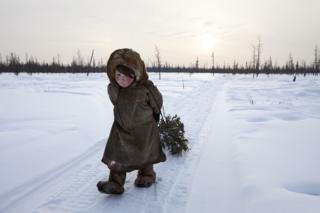 Here a young girl collects firewood. Photographer Justin Mott: "This image puzzles people: 'Why aren't the elephant's legs visible if it's swimming in the same pool as the girl?' The answer is very simple. The elephant isn't in the water at all! 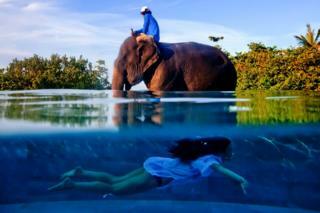 The girl is swimming in a very large, above ground infinity pool, while the elephant is standing on solid ground behind it. I had to get into the pool and dip my camera - covered in a waterproof bag - half in and half out of the water." 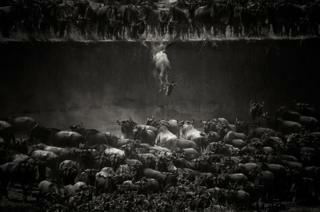 "A herd of wildebeest got confused in the rain, and crossed a river in both directions. A small group tried to cross back to rejoin the larger group that appeared to be moving on - but they reached a spot that was too steep to cross. This animal did not wait its turn to move and just jumped on top of the others." 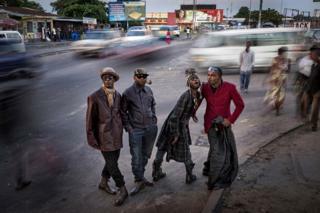 "Les Sapeurs" are a unique group of people who wander the streets of Kinshasa wearing expensive designer clothes, despite the poverty around them. Although their appearance could indicate they are very different from other men in DRC, all the men in this image have children and normal jobs. 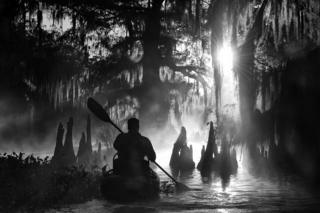 Photographer Marsel van Oosten: "Kayaking amongst the giant cypress trees on a misty morning on one of the countless bayous of the Atchafalaya basin, the largest US wetland. In my photography graphic shapes and lines are very important, and so is the absence of clutter. However, the swamps in Louisiana are exactly that - cluttered." Travel Photographer of the Year at 10 Stockwell Street opens at Greenwich in London on 4 August and runs until 3 September 2017. All images subject to copyright and provided courtesy of Travel Photographer of the Year.